A second Central Africa diocese has witnessed a vote of no confidence in their bishop and calls for his resignation. Parishioners from three Mutare parishes have presented a petition to the Diocese of Manicaland calling for the dismissal of the Rt. Rev. Erick Ruwona for abuse of office and theft. The latest turmoil in the Eastern Zimbabwe diocese follows a 2017 intervention by the Archbishop of Central Africa, the Most Rev. Albert Chama, between leaders of St Agnes Church and the bishop. Extracts from the petition published by the Morning Post allege over $2 million has gone missing during BIshop Ruwoma’s tenure in office, including $1.1 million in school fees, $450,000 in loan proceeds and a $250,000 overdraft from Agribank, and the proceeds of special collections taken by the diocese. Bishop Ruwoma responded by shuttering St Agnes Church on 17 March 2019, claiming the parish was the epicentre of unrest in the diocese. In March 2017 Archbishop Chama ordered Bishop Ruwoma to rescind his excommunication of 40 members if St Agnes church and to restore to office the parish vicar, the Rev. Gilbert Mbona. In 2016 Bishop Ruwoma suspended the rector of St Agnes on suspicion of having committed adultery and appointed the former Bishop of Harare, the Rt. Rev. Sebastian Bakare to serve as priest in charge of the parish. However, leaders of the congregation refused to accept Bishop Bakare, citing his involvement in the political campaign to unseat President Robert Mugabe. When Bishop Bakare attempted to take possession of the church, protests ensued. In December 2016 Bishop Ruwoma excommunicated 40 members of the congregation and asked a civil magistrate to issue a restraining order against 26 members of the church for their role in the protests.. Supporters of the protesters told Anglican Ink they believed Bishop Ruwona and a lay leader of the church, Mrs. Portia Magada, were seeking to gain control of the church against the wishes of the congregation. They also charged Bishop Ruwona with financial misconduct and mismanagement, alleging that while he was receiving his stipend, other clergy had not been paid for several months. A counter charge was made, however, that those in rebellion are supporters of former bishop Elston Jakazi. In 2007 the then Bishop of Harare, the Rt. Rev. Nolbert Kunonga, withdrew the diocese from the Church of the Province of Central Africa to form the Anglican Church of Zimbabwe after the province began ecclesiastical proceedings to investigate the controversial bishop on charges of fraud, heresy and attempted murder. Dr. Kunonga, who was an ally of the ruling ZANU-PF Party and President Robert Mugabe used the power of the state to expel congregations and clergy from churches that did not pledge their loyalty to him. Dr. Kunonga was joined by the Bishop of Manicaland, the Rt. Rev. Elston Jakazi in the schism. However in 2012 the Supreme Court ruled in favor the Province against the breakaway bishops and Bishop Jakazi lost control of St Agnes. The province appointed a new bishop in 2012, who abruptly resigned however in 2015, leading to Bishop Ruwona’s appointment. In March 2017 Archbishop Chama met with Bishop Ruwoma and the Rt. Rev. 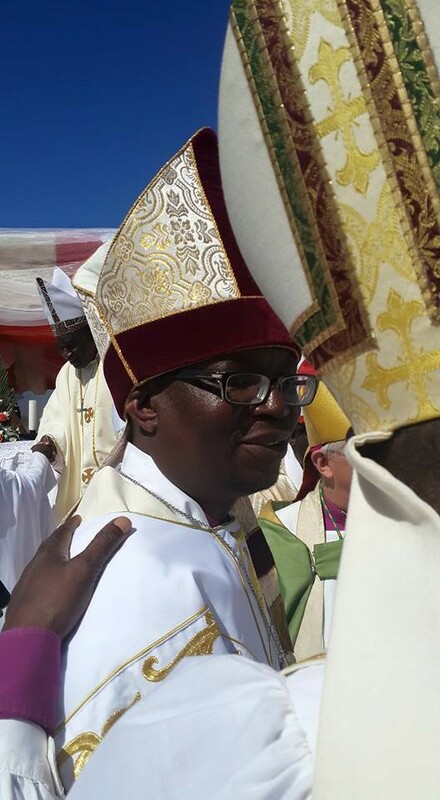 Chad Gandiya, Bishop of Harare and president of the Zimbabwe Anglican Council. Archbishop Chama asked Bishop Ruwoma to restore Fr. Mbona to office, discontinue the civil litigation and rescind his excommunication of the 40 parishioners. The truce has failed to hold, however, the Morning Post reports. The newspaper further reported the bishop had turned to leaders of the ruling ZANU-PF political party to enforce his authority by using the police to shut down lay protests around the churches.